It doesn't get better than this! Located directly across from ocean, the views are just as good as being oceanfront . This location will be better than staying in Newport since you won't have to look for parking for the beach, but can still go shopping and sight seeing within minutes. You can keep the driving to a minimum since beach access is steps away. Local dining establishments are steps away, Flo's, and Atlantic Beach Club. You will find everything needed for your well deserved getaway. Updated eat-in granite kitchen with GE appliances, all utensils, even a lobster pot for your own clambake. The sleeping/ living area has a brand new convertible couch, leather sofa, closets, leather chair and 50' PLASMA HDTV for enjoying after a long day of sunning and touring around the island. Summer time fun: Every weekend during the summer has something going on whether its the jazz festival, folk festival, yachting brigata, kite flying, end of summer extravaganza at first beach, you won't be disappointed when you stay. Winter time fun: Even the winter brings visitors to check out the goings on like the ice skating rink in downtown Newport, the winter festival has so much for everyone including the ice sculpting, shopping, eating, and the local vendors with their special attractions. Full bath w/ shower and tub for those wanting a relaxing bath. A nice relaxing place to visit. This condo was very clean, and comfortable. Everything you need is there. It has an ocean view and is across the the street from a large beach. The Cliff Walk is within walking distance. And the town of Newport just a short drive away. There is so much to do from shopping in Newport, visiting the historical sites, tours, Mansions, dining etc. We only stayed two nights. Could have been longer. Arrangements with the owner went smoothly. We really enjoyed our stay and highly recommend it. I have stayed in several places in Newport and nothing compares to the location, view, charm and price of this beautiful, fully equiped condo which overlooks Easton's Beach! Upon arrival the condo was much larger than from viewing pictures. Very large, beautifully furnished living room with a deck that I was tempted not to leave! Kitchen with all the amenities, large bathroom and large bed room with two flat screen TV's. Kept the car in the driveway as walked to 3 beaches, Athlantic Beach club w/ live bands, volley ball, cliff walk, several restaurants, played tennis, famous Thame's street shops and marina!! It was the perfect vacation and I can't wait to return! The owners were extrodinarily friendly and welcoming of their vacation home. HIGHLY RECOMMENDED! 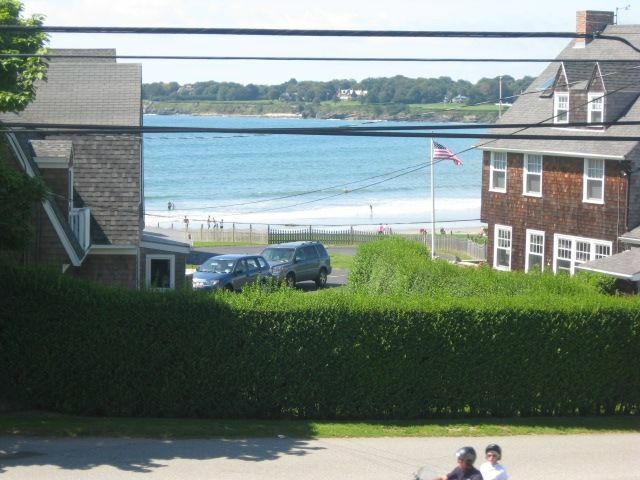 With a view of the ocean and a short walk to the historic Cliff Walk of Newport this condo is perfectly situated for a great holiday. It is warm and comfortable with all mod cons (internet access, digital tv, large fridge freezer, full oven, washer and dryer). Newport itself is a lovely town - a living museum really. For those who like to walk its a very walkable town and would take about half an hour to get into town walking from the condo. There are a few restaurants and pubs close by (easy walking distance) and the beach is pretty much across the road. I can only think of positive things to say about the place - it worked really well for us. No matter what your interests, Middletown and surrounding areas of Newport and Portsmouth have plenty of fun things to do. Water sports abound with sailing, windsurfing, kayaking, surfing, horseback riding, or just biking and walking. For those wanting to relax walk the famous cliff walk and visit the famous Bellevue Ave. mansions just minutes away. The 10 mile ocean drive is nearby and great for both driving and biking. Enjoy local shopping and restaurants, not to mention the night life, you won't know where to go first. Even the kids will find lots to do right at the beach with a carousel and aquarium not to mention a playground and skate park. If you have time and want to further explore take a ride to the other beaches of 2nd beach (Sachuest beach) for surfboard and kayak rentals and then off to 3rd beach (Sachuest Point) to explore the beauty of natures bounty while hiking and biking the trails around the Norman Bird Sanctuary, or even horseback riding by the water. Only 1 small pet under 15lbs is allowed with approval. No refunds on reservations cancelled before 90 days. Please leave Condo in the same well kept manner as when arrived. Thank you.